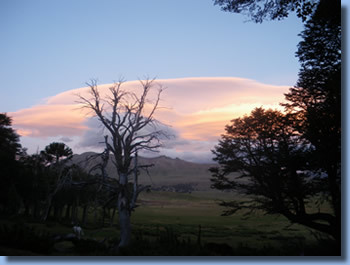 Combining the 3 main landscapes of the northern Patagonia: lush virgin rainforests, the glacier world of Sollipulli Volcano and the open wide high planes of Argentina. 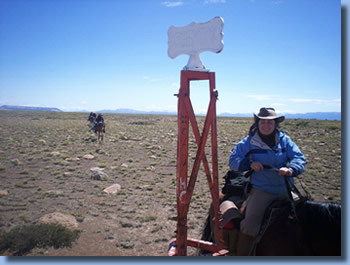 Cross the Andes with us plus ride to the crater of dormant Sollipulli and get the best of two worlds and two historic horse cultures! From the snow-capped volcanoes of the Chilean Andes and the majestic crater of the dormant Sollipulli through a pass in Icalma, to the open valleys of the Argentinean pampas, we'll explore and witness the landscape transition as we ride. Encounter smoking volcanoes, a deep blue glacier, snowy peaks, deep blue mountain lakes, and dense, towering rainforests during this once in a lifetime experience. 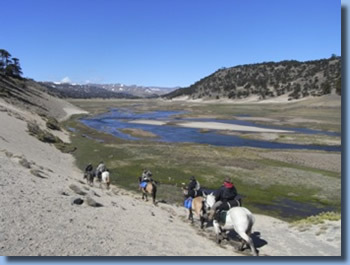 On the Chilean side we'll experience steep mountains and endless virgin rainforests as well as the breathtaking high Andes with stunning views on our low, sturdy Chilean Criollo horses. Crossing the border, we'll witness the unique Argentinean gaucho lifestyle, the vast plains, and the dramatic cliffs where we can admire the majestic Patagonian condor. Pick up in Pucon or Temuco in the afternoon, welcome to the farm. Time to get to know the horses, tack and equipment, and to get settled. 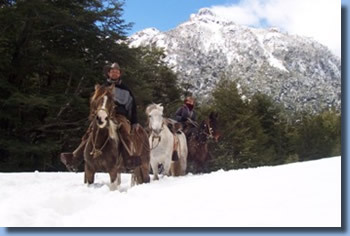 We go for a day ride through the Mapuche Indian Community Quelhue and along the rapids of Trancura River to evaluate your riding experience, get familiar with saddle and tack, and to determine which horses to take to our great adventure. In the evening we enjoy a Chilean BBQ in our first tent camp on the shore of Lake Geppinger. We ride through virgin rainforests and dense stands of Coighue trees and bamboo, and pass by crystal mountain lakes and gurgling creeks. The trails lead through the National Park Huerquehue, in the evening we put up our tencamp besides the natural hotsprings in Rio Blanco Valley. 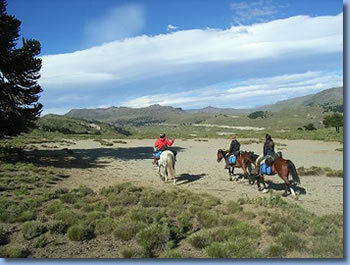 We ride along the slopes of Sollipulli volcano, overnight in the mountain lodge “Nevados de Sollipulli”. 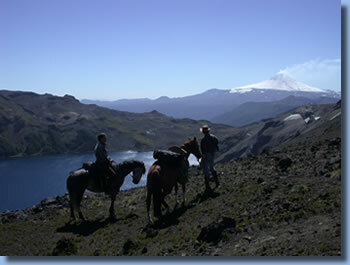 We ascent on horseback to the top of Sollipulli volcano, reaching its 2.5 miles wide crater which is filled with a 660 feet deep glacier. We return to “Nevados de Sollipulli” for a second night. 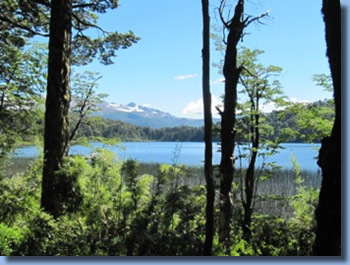 We cross the last range before Argentina and spend the night in a cabin at the shore of Lake Icalma. After arranging custom formalities with the Chilean border control we cross the border 20 meters on foot, and greet Hernan and his wonderful Argentinean horses which will bring us through the unique world of the Argentinean Andes for the next three days. We ride up to the top of Batea Mahuida Volcano with 6560 feet the highest point on our ride. Overnight in tent camp. We ride the valleys and cliffs of Argentina, watch condors pass us by and enjoy amazing views over the endless wide open spaces of this uninhabited part of the world. On the evening of the 10th day we reach the outpost were Hernan lives with his horses and which marks the end of our journey. We celebrate the end of the trek with a typical Argentinean BBQ while recounting our adventures from the past week and sharing our impressions of this experience of a lifetime. Transfer from Hernan's ranch back to Chile. Drop of either in Temuco, Temuco airport or Pucon. 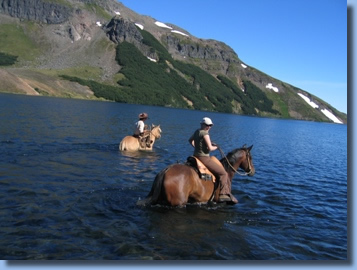 Intermediate physical condition, experience on horseback is necessary. We ride up to 8 hours a day with breaks; walking, trotting and cantering. 6 nights in double rooms in cabins, 4 nights in tent camps. In the tent camps 2 riders share one tent. We always try to give solo travelers a single tent. Because of weight issues this may not always be possible. Showers on 6 days, toilets on 7 days, natural hotsprings on one day, hot tubs on 2 days. Complete food and soft drinks from dinner on the first day to breakfast on last day. On the trail we have breakfast, a snack at midday and dinner at the campfire. We serve wonderful Chilean and Argentinean wines for dinner. Here is a suggestion of things to bring to the ride. 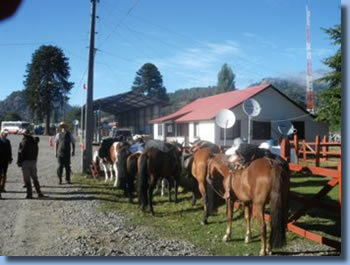 Luggage is carried by pack horses in Chile and accompanying truck in Argentina. On the last night in Chile we meet a supply truck that brings a second change of clothes for the Argentinean leg of the ride. We are proud winners of the 2015, 2016 and 2017 Trip Advisor Exellence Award.